A ‘lite’ review of an attempt to improve motif screening of genomes using additional data. Considering local minima of histone acetylation in a context of high histone acetylation may be one way forward. A number of years ago at a biotechnology sector after-talk drinks I found myself trying to convince a CEO that often the better way to improve a predictive method is not to continually refine the one measure, which often results in a ’law of diminishing returns’ effect, but to find a complementary independent measure and use the original measure and the new measure together to improve the prediction success. Recent years have seen similar approaches taken to improve scanning genomes for transcription factor binding sites. Transcription factors regulate the rate of expression of genes by binding short DNA sequences in the genome, in neighbour of the gene they regulate. DNA in eukaryotes is packaged using histone proteins into arrays of nucleosomes. 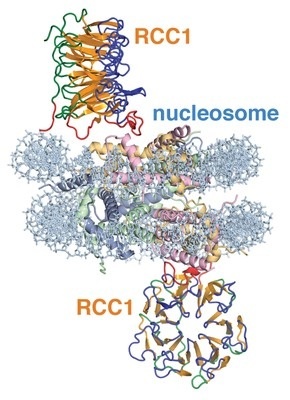 Chemical modification of the histone proteins correlate with the nature of the packing of the DNA, to form either condensed or open chromatin. Active genes are associated with open chromatin. Open chromatin – portions of the genome associated with genes that are actively being used –are charactered by a number of features in their chromatin such as the acetylation of histone H4. Some experimental approaches identify the binding sites of some transcription factors (more-or-less) directly, in particular a technique known as ChIP-seq (ChIP = Chromatin Immuno-Precipitation). As the name implies this involves antibody-based isolation of the DNA sequences bound by the transcription factors to obtain short DNA sequences that the transcription factor is binding to. Besides giving the (general) location of where the TF binds, with a large collection of the DNA sequences bound by one transcription factor collected in this way, you can determine the common DNA sequence within the DNA sequence fragments found (which itself has issues that I am not going to cover here). This common DNA sequence – the binding site for the transcription factor – is usually represented as a profile or motif. While a very useful approach, this will not work (well) for all transcription factors. Like all experimental approaches, some transcription factors will not ‘play along’. Prior to ChIP-seq being common, a number of approaches started by first identifying what DNA sequences the protein (the transcription factor) bound, then searching the genome for matches to the profile or motif identified. The first step in these methods are variations on the concept of creating a mixture of DNA sequences (a sequence library) and screening these to see what DNA sequences the protein bound. In similar fashion to my conversation with the CEO, Stephen Ramsey and colleagues reasoned that they could improve predictions of transcription factor binding by using additional independent measures such as the epigenetic state of the region of the genome. Broadly, the concept is that if a matching motif was found within chromatin that was open in the cell type the transcription factor was active in, the matched site was more likely to be one bound by the transcription factor. 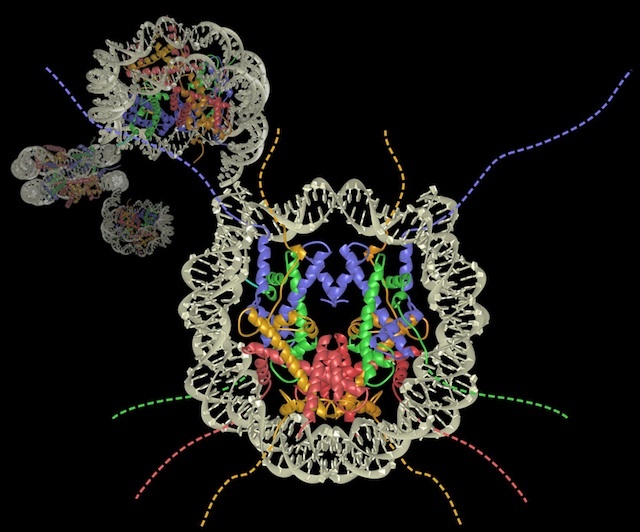 They wanted to test what additional measures, in addition to a motif for the transcription factor, might improve the prediction of binding sites. To test this five transcription factor motifs were considered. ** Four were used to train their prediction model, using the area under a sensitivity versus false positive rate (FPR) curve as the target of the training, the fifth being used to test the trained model. This is applied with each TF being the one left out for testing, in turn. The bottom-line is that local regions of local histone acetylation in the context of high histone acetylation usefully lifted the prediction accuracy of the motif screens. For those wanting a little more detail without having to dig it out of the paper – which is very readable, by the way –here is a little more on what they did. The five additional measures they tested were histone acetylation ChIP-seq scores, the presence of local minima of histone acetylation (derived from the HAc ChIP-seq scores), GC content (regions of high GC content have indicated to be associated with gene regulatory regions), vertebrate sequence conservation (if the local region is conserved in other species, it is likely to have a functional role), and the presence of nucleosomes (TF binding is associated with regions of low nucleosome occupancy). They also considered if the environmental state of the cell mattered (it does, as you might expect). Testing pairs of these measures, with one being the motif and the other being the additional measure, they found that local minima of histone acetylation and the motif gave the largest improvement in prediction accuracy. 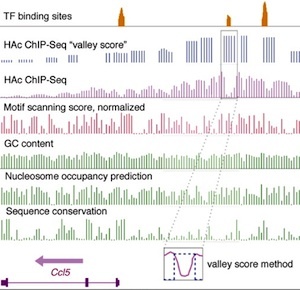 The HAc ChIP-seq alone offered some improvement, but to varying degrees from one transcription factor to another. GC content and sequence conservation shows small but consistent improvements in prediction accurately and so were statistically significant. Three-feature models did not show statistical improvement over the two-feature models; this may be a reflection of the limited binding site data used. * Clearly, this is meant as a sweeping generalisation. 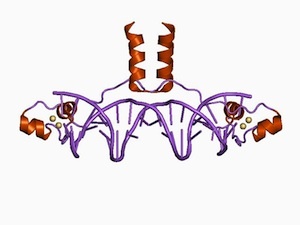 ** The five transcription factors were: ATF3, C/EBPÎ´, IRF1, NFÎºB/p50 and NFÎºB/p65.